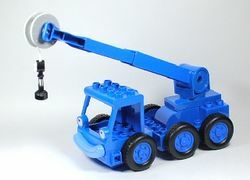 Lofty is a machine that Bob the Builder uses often in the Bob the Builder theme. He was first produced in DUPLO form in 3273 Bob, Lofty and the Mice in 2001. This page was last edited on 9 January 2016, at 22:06.